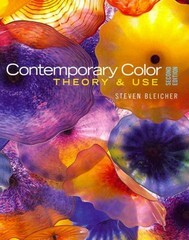 Contemporary Color 2 Edition CONTEMPORARY COLOR is back with a beautifully produced and lavishly illustrated second edition! Combining a solid grounding in traditional color theory and a thorough exploration of effective color use in digital applications and 3D design work, this introduction to contemporary color text is a must have for all art students. Written by a leading design educator and artist whose work is widely exhibited, this text features a balanced examination of essential theory and its practical application using today's cutting-edge technology. Contemporary Color, second edition covers a wide range of topics including all the basics on color theory, while also examining the latest on digital color, 3D design, and variations in color across nations and cultures. To complement this inclusive content, the text features thought-provoking discussions of the psychological impact of color, the future of color, creativity, and best practices for students and working artists. A vast collection of vivid images, drawn from both classical and contemporary artists, rounds out the text with powerful examples to illustrate applied color theory in all of its dazzling diversity.